Sometimes, unexpected things would happen to get in the way of our daily routine. This dessert was made to cheer my daughter up as I hadn’t had enough time to cook dinner for her before she went out the other day. She missed her favourite pumpkin soup and favourite pasta. 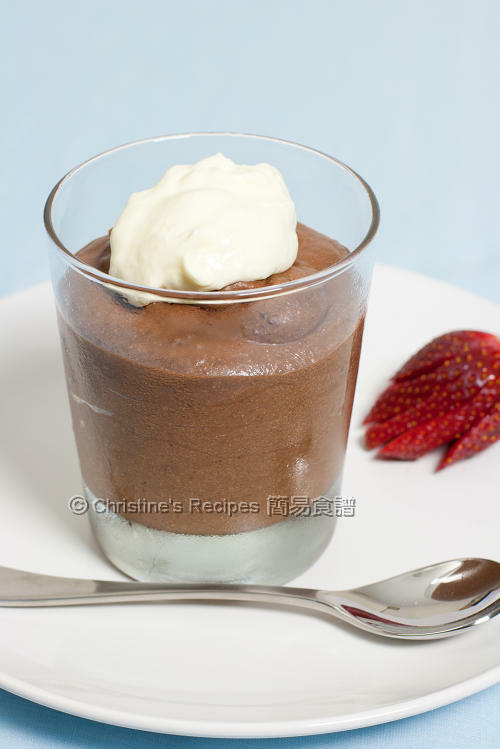 Before she dashed out the door, I promised to make her this chocolate mousse. Chocolate and cream are wonderful partners, that work so well with a spirit-boosting result. It’s a quick dessert. What I need to do is to whip up the cream and egg white, then combine all the ingredients, chill in my fridge. Then the dessert is ready to serve at any time. She's very happy with the reheated soup and pasta, followed by the chilled chocolate mousse. Place the chocolate and butter in a large mixing bowl, over a pan of simmering water and leave to melt, stirring ooccasionaly. Remove from the heat and let cool down a bit. Add the egg yolk and combine well. Set aside. Meanwhile, add the cream, sugar and vanilla extract in another clean mixing bowl. Whip until silky, smooth with soft peaks. Place the egg white in a clean bowl. Sprinkle with a pinch of salt. Beat with an electric mixer until stiff peaks form. Transfer the chocolate mixture into the whipped cream. Use a spatula to fold-in the egg white. Divide the mixture and spoon into 4 serving cups. Chill in fridge until set, about 1 hour. Serve with strawberries or other favourite fruits and top with some whipped cream. If the mousse is put in the freezer, it’d quickly be set in 15 to 20 minutes. When beating cream or egg white, the utensils, including the mixing bowls and beater have to be very clean. Make sure there’ll be no trace of oil or egg yolks. Thanks for sharing this dessert, I think it will cheer my son up too! I need something chocolate today. It somehow always has a cheering-up effect. The look of your chocolate mousse already brings smiles :D If my girls see this, I'm sure they will want me to make too! Thanks very much for sharing. Yum, yum - nice clicks and am sure it tastes fantastic. Your chocolate mousse looks just heavenly! 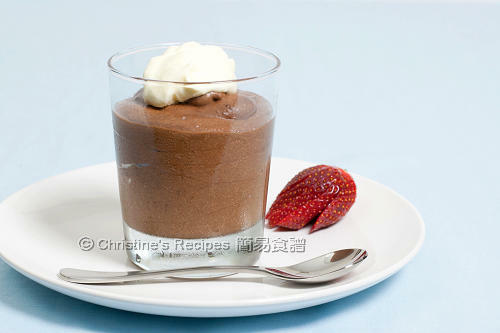 This chocolate mousse reminds me of the ones we used to eat when we were kids, simple but luscious, a classic. I tried this and it turned out awesome, thanks! Not like another recipe I tried, in which I simply could not get the food texture to come out right. Wonder if you have a recipe for red bean milk iced drink? oh yummm! thanks for the recipe, i've been looking for a good chocolate mousse recipe for the longest time!